Our goal for children at this stage is to help them develop harmoniously in their physical, social, cognitive, and academic domains. We also help children to increase their concentration skills and to refine, categorize, and expand their previous knowledge. The 3-to 6-year-old child needs freedom to move and to use his or her hands to learn. The hands are the tools that help the young child learn at this age. All experiences must be concrete and allow for manipulation of materials. Most of the presentations of materials are given to individual children because the child is still self-centered. It is not until the age of ~4 1/2 or 5 that children work more in group activities, except for Language activities. Above all, teachers and staff work together to create a warm, safe and nurturing environment for each child. There is a focus on modeling and interacting with respect, courtesy, and compassion for every individual. Teachers carefully guide children to navigate social situations with an emphasis on the safety and well-being of all members of the group. Through interactive games, children learn the courteous language and gracious actions necessary to navigate the classroom and various social situations like how to greet a guest, how to invite a friend to play, or even how to carefully push in a chair! These vignettes of various social situations give children information about how to handle situations at school and in the real world. These activities allow the child to practice everyday skills that help with the development of independence and Executive Functioning skills through activities such as the “zipper frame,” sweeping, polishing, washing dishes, caring for plants, preparing food etc. All of these activities give the child the opportunity to become proficient with self-help skills. 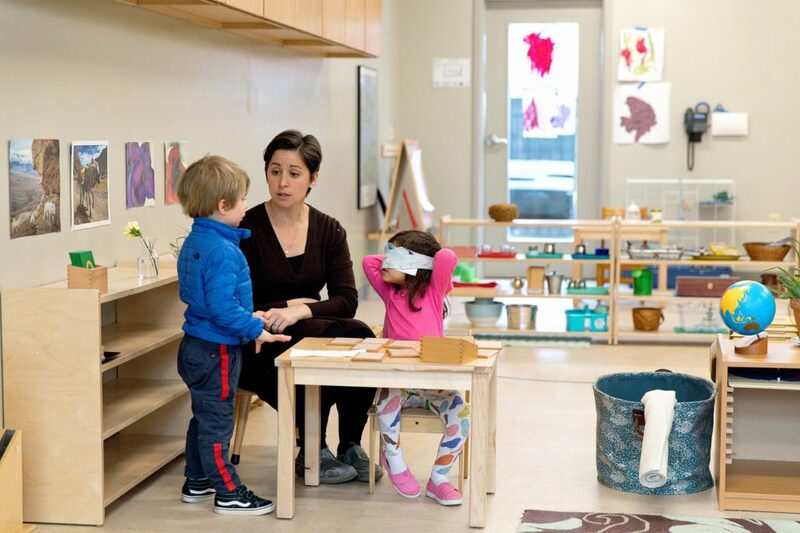 They also significantly contribute to the development of the child’s concentration, refinement of fine and gross motor skills, and the development of self-esteem as they accomplish tasks they see done around them by adults and contribute to their classroom community. 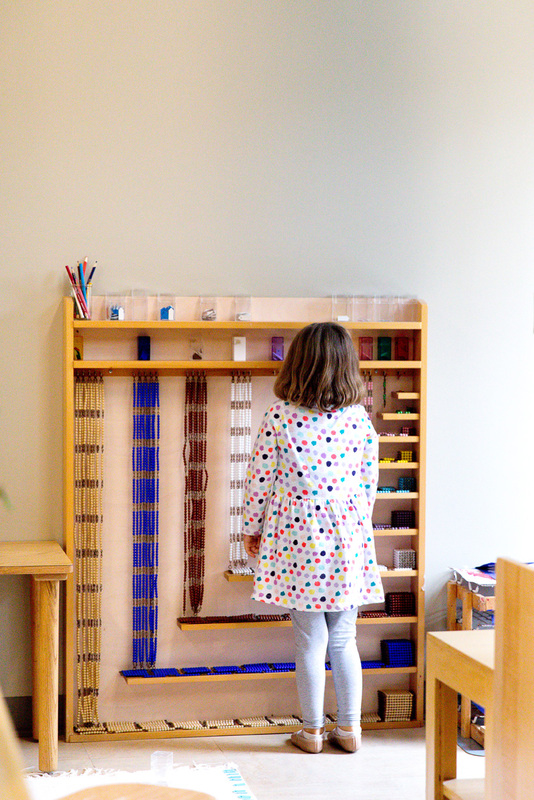 These materials refine the child’s senses, which are still developing. Materials requiring tactile, auditory, olfactory, gustatory, and visual discrimination of size, shape, and color are used to enhance the refinement of each sense. In addition, these give geometric experiences and vocabulary. Sensorial materials are also used in other areas of the classroom, such as the language area – to provide the qualitative vocabulary (i.e. rough, smooth, thick, thin) as well as geometric terminology to teach about triangles, angles, and different two and three-dimensional shapes. We also use sensorial materials in the study of biology with the study of leaves, parts of plants, flowers, and animals. The young child is fascinated by language. We offer children plenty of opportunities to acquire new vocabulary, giving the exact name of anything that is of interest to them: bugs, insects, flowers, trucks, etc. We have a phonetic approach to reading, which is teaching the sounds of the letters instead of just the names. This enables the child to blend sounds together and read more easily. From learning phonics, we will guide the child to learn phonograms, combine letters to construct words, decode sounds to read words, and learn sight words. Through interactive games, children experience the role of various parts of speech in a phrase and the importance of word order and grammar in sentences. Through the Language curriculum, children have an opportunity to explore self-expression. All of the materials in this area are concrete representations of the abstract concept they are designed to teach. The child manipulates rods, beads, spindles, etc. to understand the concept of numbers one through ten, the decimal system (units, tens, hundreds, and thousands), and all four mathematic operations. By the end of the third year in Children’s House, children usually start memorizing math facts and have gained a solid understanding of the four operations. Fractions are also presented and explored with concrete materials. Geography, History, Biology, Botany, Zoology, Art and Music are presented as extensions of the sensorial and language activities. We introduce children to geography through puzzle maps, pictures, stories, cuisine, and artifacts representing a specific country or continent. Music and art are also integrated into the Children’s House program. 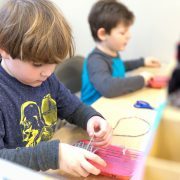 In addition to integration through Montessori Materials such as the Bells, children engage in music activities using rhythm, movement, songs, and listening activities. Children learn to match pitch and may begin exploring the basics of reading and writing music. Children are exposed to art through various concrete experiences that focus on experimenting with different media. The fine arts program introduces children to the basic building blocks of visual art through media exploration and also introduces them to art appreciation. School Hours for Children’s House first- and second-years (approximately 3 & 4 years old): 8:10-8:30 a.m. drop-off; 12 noon pickup. After School is available until 3 or 5:30 p.m.
School Hours for Children’s House Extended Day (Kindergarten equivalent, approximately 5-6 years old): 8:10-8:30 a.m. drop-off; 3 p.m. pickup. After School is available until 5:30 p.m.